With these new plates you can install low voltage cables behind your flat panel TV, your amplifier or other audio/video devices, flush to the wall surface. This plate's innovative "mounting wings" eliminate the need for a low voltage mounting bracket. The mounting wings are molded into the Easy Mount wall plate and fasten tightly against the back of the drywall. With these new boxes you can install low voltage cables behind your flat panel TV, your amplifier or other audio/video devices, flush to the wall surface. With these new plates you can install low voltage cables and power behind your flat panel TV, your amplifier or other audio/video devices, flush to the wall surface. With these new kits you can install low voltage cables behind your flat panel TV, your amplifier or other audio/video devices to your equipment room. 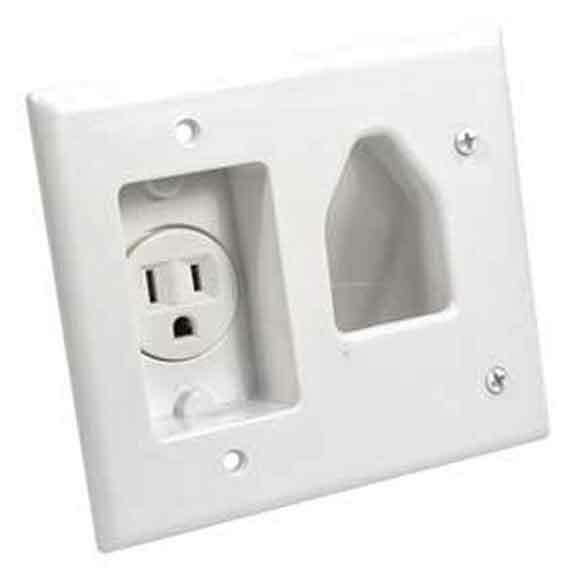 1-Gang Low Voltage Mounting Bracket for use with existing walls. Can be mounted vertically or horizontally. Recessed wall plates give your set up a complete appearance and you also get the flexibility of using cable types of your choice. At SF Cable, you can find a range of up to 3-gang recessed low voltage cable plates, easy mount low voltage cable plates (available in slim fit as well), recessed media boxes, recessed low voltage cable plate with recessed power, and recessed pro-power kit with straight blade inlet, among other products. All the products are manufactured by ISO 9001-2000 registered manufacturers and sourced directly from them to keep competitive prices for our customers. We aim for complete customer satisfaction and provide quality after sales services on all our products. We also provide lifetime technical support on our products.